Emotional development starts in infancy when babies feel and react to basic feelings of joy, fear, anger, sadness, surprise and disgust. These feelings are purely physical and serve to keep the baby safe. As children grow, they are exposed to new situations, their range of feelings, thoughts and actions expand and their emotional lives become more complex. How children respond to different feelings affects their daily choices, behavior and well-being. Developing emotional understanding and management is very important in the early years. When children are aware of what they are feeling and are able to describe these feelings and recognize them in others, they are better able to manage and express all of their feelings in respectful ways. These skills are important for getting along with others, staying alert and engaged in activities and for solving problems peacefully. • Where am I on the feelings gauge? • Is this feeling helpful for what I am doing? • If not, what can I do? Download the Feelings Gauge and follow these instructions. When in the green area, the upstairs brain is able to absorb and process incoming information and effectively maintain coordination of the downstairs brain. The brain is balanced, focused, able to think and respond mindfully. When in the yellow area, the amygdala is agitated allowing less information to get through to the upstairs brain as the downstairs brain is increasingly active and gearing up to protect and defend. The upstairs brain is beginning to shut down and is losing its grip on the downstairs brain. This means that it’s difficult to stay mindful, objective and non-judgmental. At this point the brain and body want to shift to a more intuitive, primal response and just act. In the red area, the downstairs brain is fully active and the upstairs brain has completely lost hold. All actions are driven by emotional impulses and there is little conscious thought here. It is important to understand that when someone is in the red area, they are not able to absorb, think, and process information. The upstairs brain, where we process and analyze information, is shut down. This means trying to reason or make sense of a situation or behaviour can be futile. What the child needs now is an adult to help them calm down by using strategies like the feeling gauge. In his book The Whole-Brain Child, Daniel Siegel, Professor of Clinical Psychiatry, suggests that when children are in the red area, what is needed from the adult is attunement. This includes tuning in and reconnecting with them with a hug, a touch or just being present. This can allow their brains to calm down making next steps possible. Explain that sometimes it is hard to understand how we feel inside. This tool gives us a way to bring inside feelings outside so we can have a look at our feelings and learn how to manage these feelings. You can use both your own and their facial expressions, stories and body movements to illustrate how it can feel to be in each area of the gauge. It is important to say that being in any of these areas is normal and most of us probably visit each area every day. Talk about how it feels in the body while being in each colour and ask them to describe what changes in their bodies when they feel anxious, excited, angry, etc. You can ask about changes in breathing, temperature, heartbeat and energy. You can also inquire if there are specific parts of the body where they feel these changes and whether these changes happen right away or they build up and get stronger. Use the colours to describe your own feeling states. The colours provide a neutral (not ‘good’ or ‘bad’) way to communicate about how we feel. Ask children to describe the feelings of characters in stories or people around them using the colours in the feelings gauge (such as “what colour do you think she is feeling here?”). Extension Activity: What I Can Do? Encourage the children to think about what they can do to move back to the green area of the gauge when they are in the yellow area or the red area. Brainstorm and share ideas and even write them down on the gauge. Simplest actions work the best, such as take a drink of water, take deep breaths, etc. It is helpful to think of these areas like a traffic light. When it’s green you can go! It’s easy to do what you need to do. When it’s yellow it’s time to slow down or speed up. Maybe it’s helpful to have this energy state if you are about to run a race, perform or do something brave. But if it’s not helpful for what you are working on, this might be a good time to take a break, ask for help or do something else. When it’s red it’s not possible to keep going! Stop, ask for help and calm the body and mind down before moving ahead. 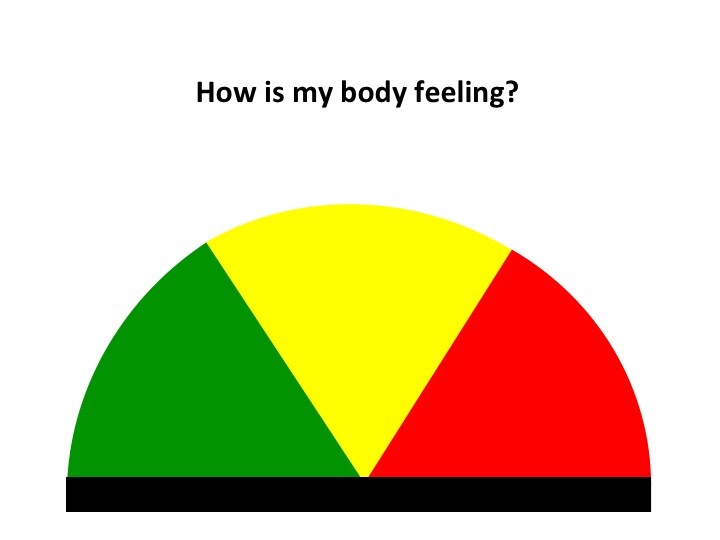 Using this feelings gauge tool regularly throughout the day, especially during transitions (such as coming in from outside or settling down for a meal) can be valuable in building emotional awareness. This also comes in useful when emotions are starting to rise up as just being able to indicate what they are feeling or that they are in a yellow area can help calm the brain. In a long term study, Jones, Greenberg, & Crowley (2015) found that having higher social-emotional skills in kindergarten is related to important outcomes at age 25 in a range of domains: education, employment, criminal activity, substance use, and mental health. To download the image click the feelings gauge link and once the image loads save it by clicking "save image as" (e.g. in Chrome right click the image and there will be a "save image as" option). Once it is saved, print the feelings gauge in landscape layout on card stock. Cut out an arrow and attach to the feelings gauge using a round head fastener as can been seen in the photograph at the beginning of this post.